I found removing the flesh from the young coconut a little difficult and too my husband's help. Here are the instructions given on Cooking channel verbatim: 'With a cleaver, make four identical cuts on the top of each coconut, forming a square; then "pop" open the tops using the back of the cleaver blade. Pour the coconut water into a glass storage jar and refrigerate for later use. Now, with a swift chop, crack the coconuts in half. Pry out the coconut meat using the backside of a large spoon'. Next time I'm planning to use this method.Wash the flesh and chop into ½" pieces and transfer them to a mixing bowl.Add all the other ingredients, except for avocado and tortilla chips, and mix well.Finally add avocado just before serving. Serve immediately with tortilla chips or refrigerate for 30 minutes to 1 hour before serving. Wash the flesh and chop into ½" pieces and transfer them to a mixing bowl. 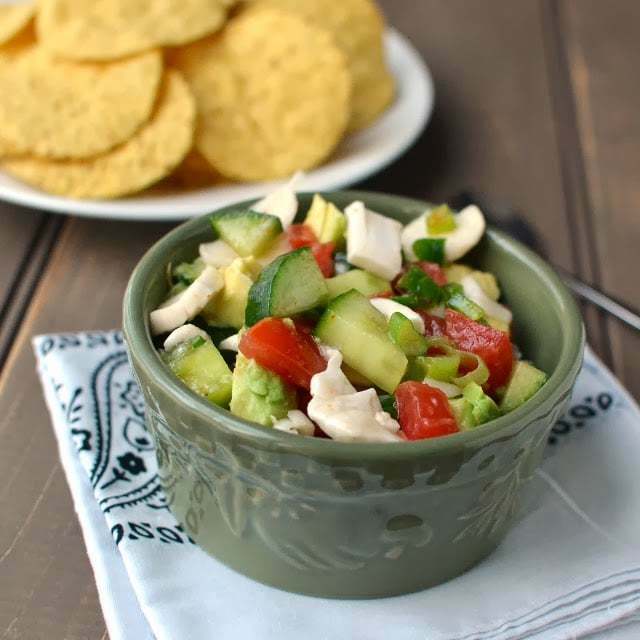 Add all the other ingredients, except for avocado and tortilla chips, and mix well. Finally add avocado just before serving. Serve immediately with tortilla chips or refrigerate for 30 minutes to 1 hour before serving.